Shocking News! 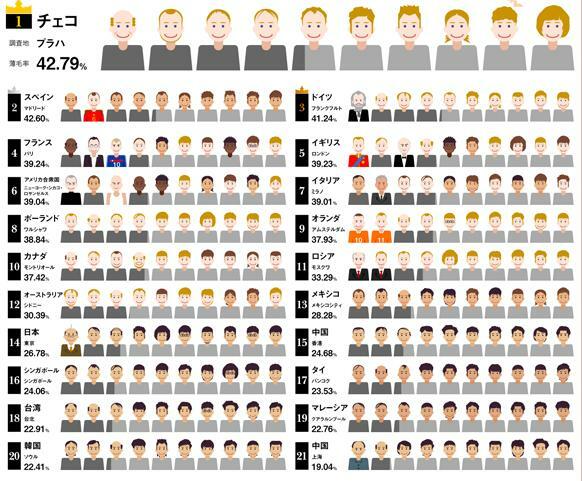 Japan has the Highest Bald Population in Asia? The findings?? Well, it appeared to be the 1st place went to Czech Republic, followed by Spain in the 2nd place and Germany in the 3rd place. 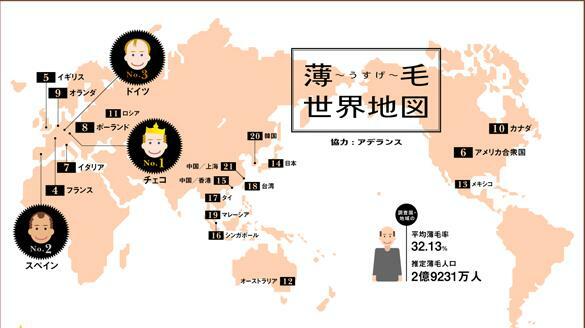 If you have a close look at this baldness map, you will find that each value of countries has popular figure; Zidane, the former French football player for France or Steve Jobs. the former CEO of Apple Inc. for the US, and the former Russian President, Golbachev for Russia. For Japan, we’ve got Namihei-san, a character of a very famous cartoon called Sazae-san. With such unique method, this map managed to include sense of humour in such a sensitive issue Lol. How clever it is～! How did you like today’s topic?